A Guide to Understanding the Motion of the Ocean. Picture it: You’ve planned the perfect day of relaxing on the beach. You have your snack packed, your favourite beach towel in tow, and your comfiest pair of flip-flops flip-flopping under your feet. You’ve picked the perfect spot and set up camp among the soft sand and seashells, much closer to the cool, refreshing water than those other chumps lounging farther up the beach. You take a moment to take in the expansive ocean view before you, before relaxing into some serious sun-bathing. You nod off with the hot sun kissing your back, and a warm breeze rushing over you. BUT THEN! You awake with a start an hour later to realize that your towel is soaked, your snack is strewn along the beach and your flip-flops are floating out to sea! The cool-refreshing water that only an hour earlier was meters away from you is now lapping against your feet and surely ruining your perfect day. “WHAT HAPPENED? !” you exclaim, furious that that ocean would play such trick on you. Tides, tides are what happened to you, and in fact, they are no trick, but one of the most predictable natural phenomena in nature. If you plan on visiting the ocean anytime soon, there are a few things you should know about them. The periodic and regular rise and fall of the surface water level of the sea is called the tide. The sea level rises with the ‘flood tide,’ moving closer to you as you sit on the beach, and falls with the ‘ebb tide,’ moving farther out to sea. Tides are formed in response to the combined gravitational effects of the moon and the sun. The effect of the moon is greater since it is much closer to the earth – about 360 times closer, in fact – even though the sun is much larger. At the point on the earth closest to the moon, the moon’s gravitational force pulls on water in the oceans causing ‘bulges’ in the ocean on both sides of the earth. The moon pulls water toward it, and this causes the bulge toward the moon. The bulge on the side of the earth opposite the moon is caused by the moon pulling the earth away from the water on that side. So the moon pulls both the water and the Earth toward it, but the effect on the water is greater, leaving the Earth sort of suspended in an oval pool. Thes water bulges cause high tides, which occurs at the same time on opposite sides on the planet. Meanwhile, the other two sides of the Earth experience low tide. As the Earth turns one full rotation each day, each side of the planet, in theory, should move from high tide to low tide (or low tide to high tide) twice each day. As we’ll see next, however, this isn’t always the case. Some points on the earth pass through both of the water bulges during a 24 hour period, therefore experiencing two high tides per day. This is referred to as a ‘semi-diurnal tide’. However, the moon’s orbit is at an angle to the earth, so some areas miss passing through one of the bulges These areas experience only one high and low tide per day; this is called a ‘diurnal tide’. 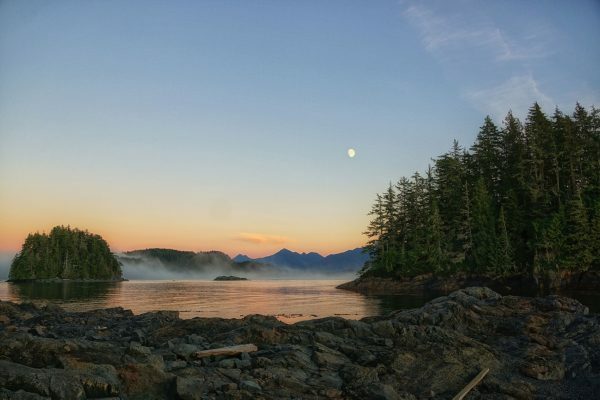 Victoria on Vancouver Island experiences a mixture of diurnal and semi-diurnal tides. When the moon is aligned with the sun, at the new moon and full moon, the sun’s gravitational pull adds to that of the moon. This causes ‘spring tides,’ resulting in higher than usual high tides and lower than usual low tides. WHY DO SOME PLACES HAVE BIGGER TIDES THAN OTHERS? Tides can vary depending on the latitude and geography of an area. At locations on the earth in line with the moon’s orbit, often at higher latitudes, the tidal range is greater. The tidal range is the vertical difference between the high tide and the subsequent low tide. Larger bodies of water have larger tidal ranges, and local geography can also act as a funnel to amplify the tide. The Bay of Fundy in Nova Scotia is known for having the largest tidal range in the world; with a mean spring range of 14.5 metres (47.5 feet) and an extreme range of 16.3 metres (53.5 feet)! 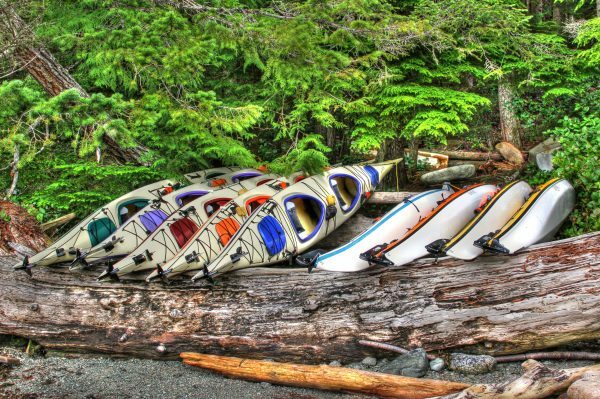 WHY DO KAYAKERS NEED TO KNOW ABOUT TIDES? A good knowledge of tides and their dynamics is an important consideration for ocean kayakers. 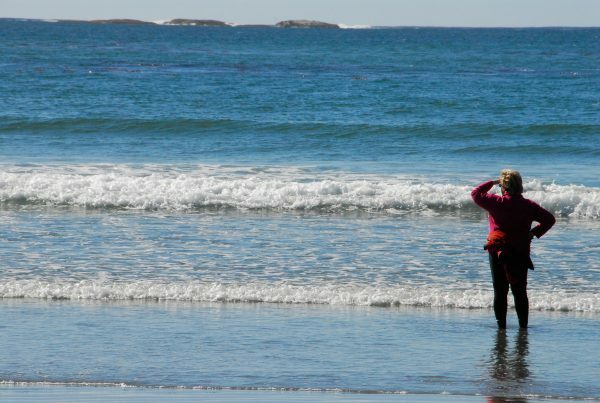 First, understanding tides allow us to safely navigate intertidal areas (the areas along a beach where ocean water rises and recedes with high and low tides respectively). If you enter one of these areas when the tide is ebbing (moving from high to low tide), you may find yourself quickly stranded on rocks that were only minutes before covered in water! Knowing when to expect tides can help us avoid such situations. Secondly, knowing about tides helps in the determination of landing areas and campsites, and in deciding where to store kayaks overnight. High tide marks give a clear indication of where we can expect water to approach at the next flood tide, This lets us determine if a beach will have sufficient camping space at high tide and if we will be able to tie our boats up above the tideline as well to avoid bumper boats in the middle of the night. watch Neil deGrasse Tyson explain the tides in this video. 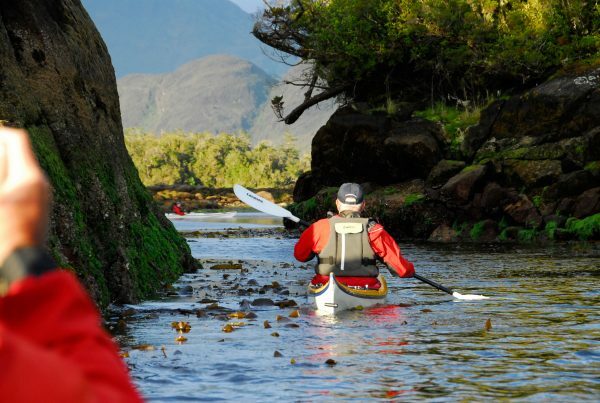 check out this video on how tides can affect sea kayakers. 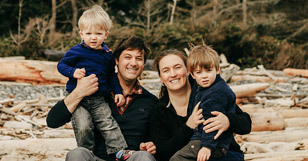 kayak Vancouver Island with Spirit of the West.